This is a tidy little package for anyone after plenty of outputs on a budget. Excellent sound quality. Packaged software. Compact. Not the only interface you'll ever need. 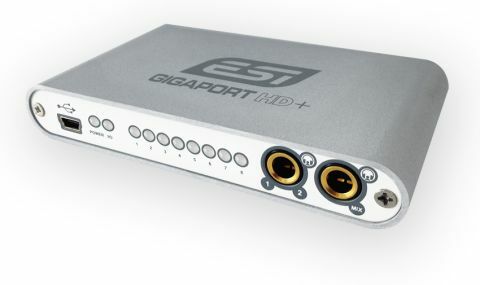 The ESI Gigaport HD+ is a dinky eight-output USB audio interface that is going to be of greatest interest to digital DJs looking to hook their virtual decks up to a four-channel mixer, which explains why the outputs are all RCA connections. It can also be used to hook a surround system up to a computer, or to feed up to eight DAW outputs to a studio or PA mixer. The two additional 1/4" headphone outputs serve up just channels 1/2 and the full eight-channel mix respectively, and a row of incredibly bright blue LEDs indicates channel activity. ASIO and GSIF-compatible (and class-compliant for consumer applications), the Gigaport HD+ operates at between 16-bit/44.1kHz and 24-bit/96kHz, depending on how many channels you use. Crucially, it also sounds great and ESI has even included download codes for Image-Line's Deckadance LE DJ and Toontrack's EZdrummer Lite software.